Click on small images to see larger versions. 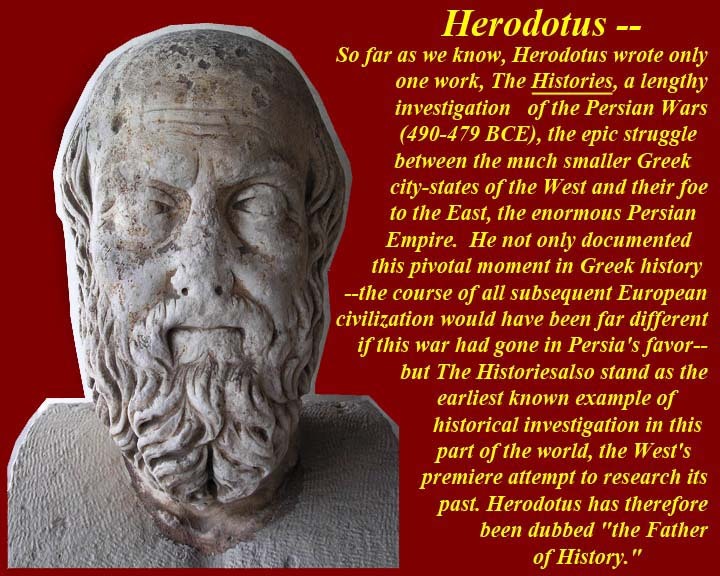 Herodotus' Histories is really our only source on the Persian Wars; all other sources seem to be derived directly or indirectly from this work. And we know the Herodotus got many things wrong. Nonetheless, we make do with what we have and pretend that it's gospel truth -- ignoring completely the fact that the Gospels themselves are almost completely devoid of any support from other sources. Herodotus was born in 484 BC so he obviously could not have participated in the defense of Greece during the Persian invasions of Darius and Xerxes. But the wars didn't really end until 449, so he lived through and may have participated in the later years of the wars. He certainly interviewed participants in the battles that had occurred during the Persian invasions, but it is clear that his informants may only have viewed small parts of the "big picture". See http://www.ancient.eu/herodotus/ for information on criticism of Herodotus as an historical primary source. Timeline from the time of Greek settlement on the east side of the Aegean Sea (i.e., on the western coast of modern Turkey) until the Peloponnesian War and the subsequent collapse of Sparta. During the Mycenaean period, the Greek poleis established many outposts in their trading areas throughout the Mediterranean (some of which they had taken over from the Minoans). 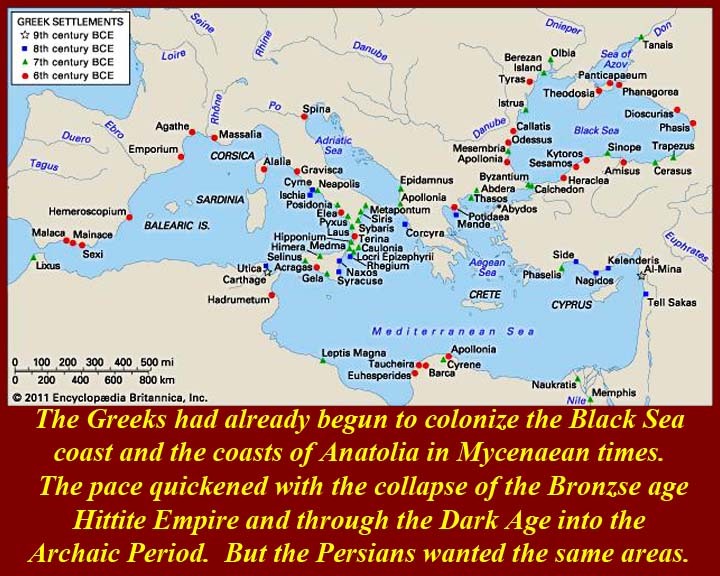 Those on the western coast of modern Turkey had become full blown settlements during the Dark Age period -- as Greeks fled the chaos associated with the collapse of the bronze age and the Dorian takeover in southern Greece. Population pressure in mainland Greece led to further emigration to these Ionian settlement during the Archaic Period. By 650 BC the Lydian successors of the Hittite hegemony on the western end of Anatolia had absorbed the Ionian Greek colonies. 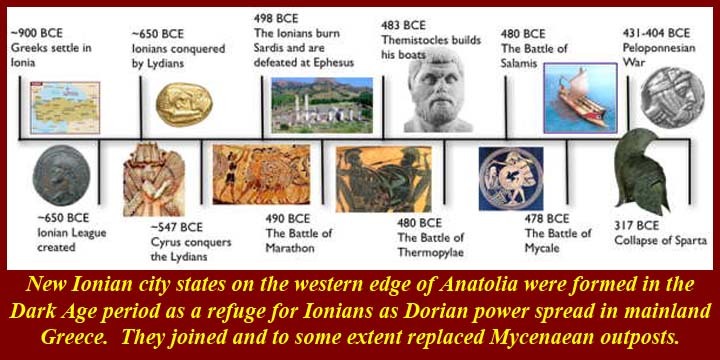 When Persia under Cyrus conquered Lydia in 547 BC, the Ionian Greeks found themselves under the rule of Persian Satraps. They didn't like either Lydian or Persian rule. 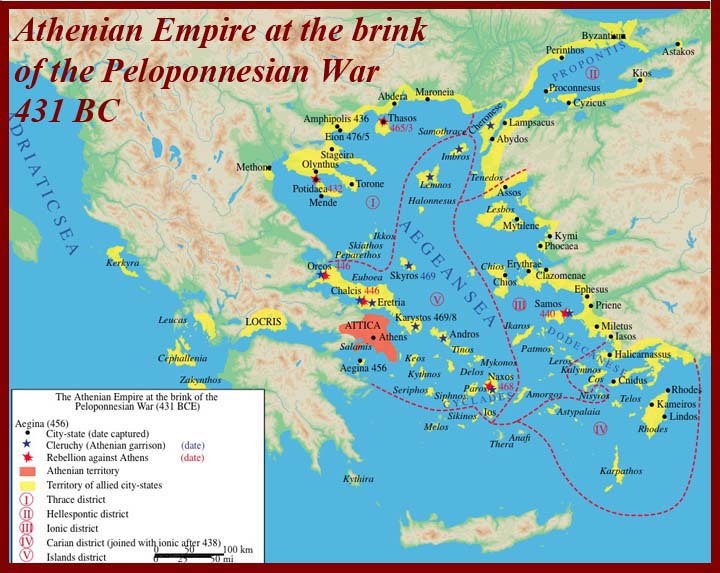 In 498 BC they revolted against the Persians, and, importantly, attracted support from Eretria (literally "city of the rowers") in Euboea, an island facing Attica and from Athens. The organizing center of the revolt was Melitus which had been settled by Athenians. 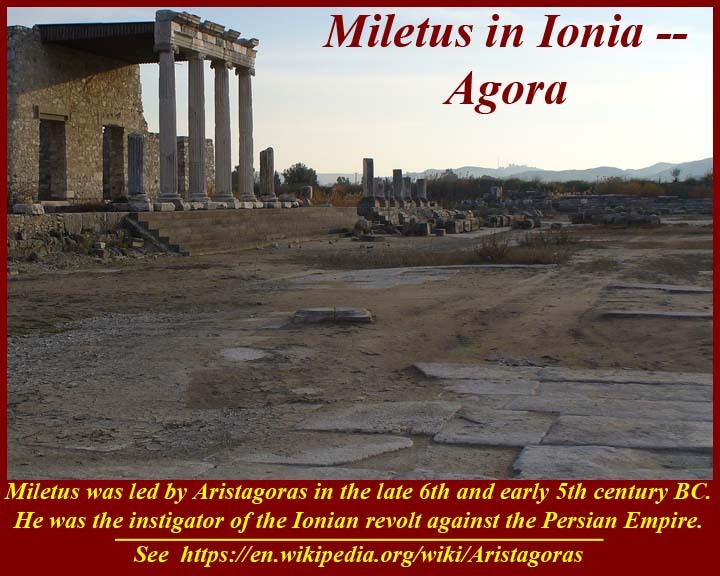 Aristagoras served as deputy governor of Miletus, a polis on the western coast of Anatolia around 500 BC. He was the son of Molpagoras, and son-in-law (and nephew) of Histiaeus, whom the Persians had set up as tyrant of Miletus. Aristagoras controlled Miletus while Histiaeus was being held by the Achaemenid King Darius I of Persia at Susa. 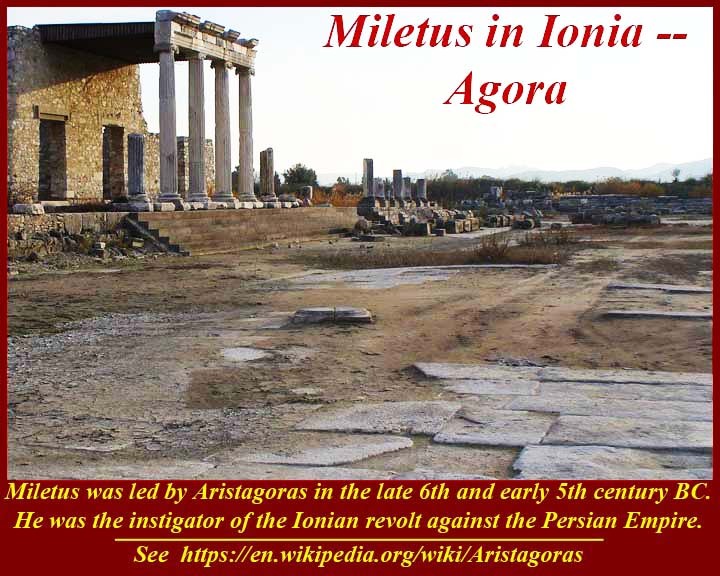 Aristagoras was the main orchestrator of the Ionian Revolt, when the Greek poleis of Ionia on the east coast of the Aegean Sea banded together to rebel against rule by the Achaemenid Empire. (https://en.wikipedia.org/wiki/Aristagoras). 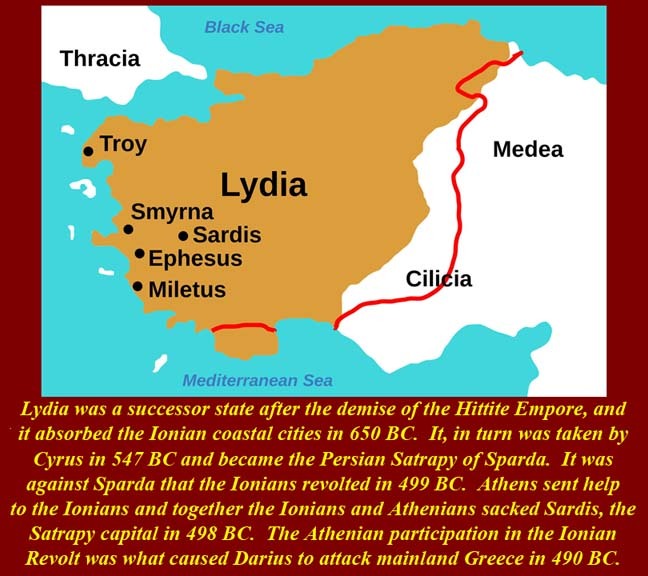 The "high water mark" of the Ionian Revolt was the sacking and burning of Sardis, the inland capital of the Persian satrapy of Sparda. 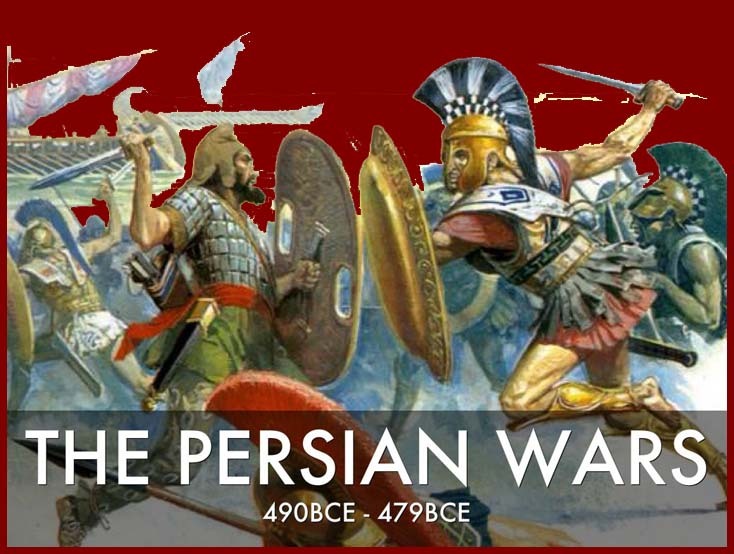 Persian reinforcements soon arrived and chased the Ionians and the Athenian and Eretrian allies back toward the coast. 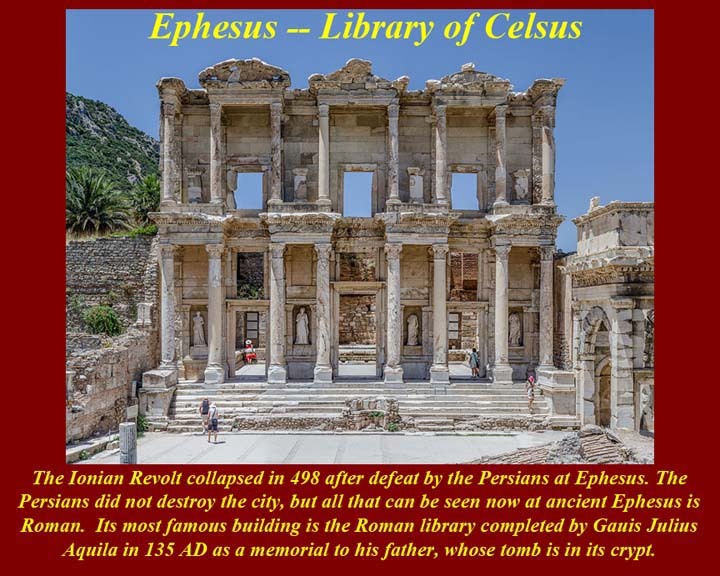 The Persians caught up with and defeated the revolutionaries near Ephesus and than sacked and burned that city in retaliation for the destruction of Sardis. 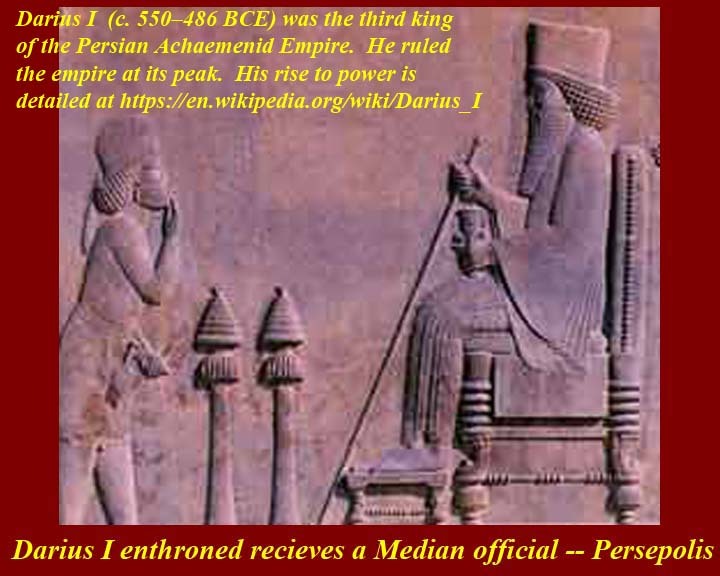 Darius (550-486 BC), the son of Cyrus, who had expanded the Persian Empire, ruled the empire at its peak. See https://en.wikipedia.org/wiki/Darius_I. 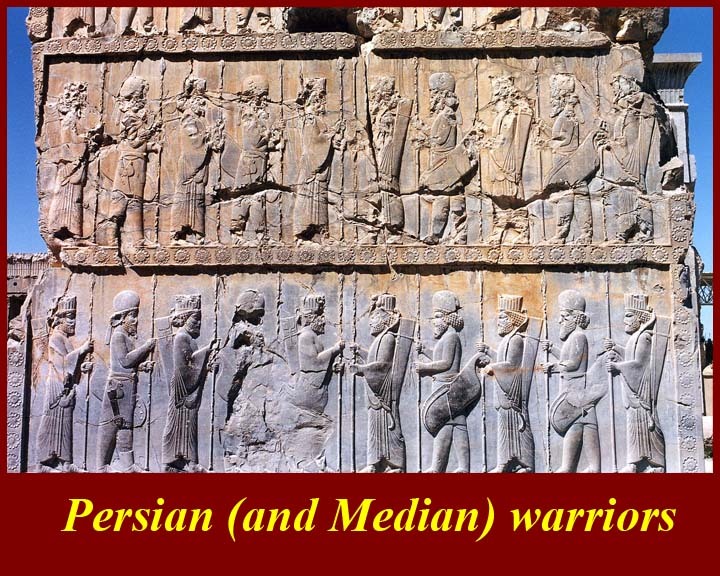 The Persian army was composed of many ethnic contingents, but it relied heavily on archers and cavalry. Greek tactics throughout the period included inhibiting the use of cavalry by choosing horse unfriendly terrain or barricading terrain to make it hard for cavalry to use and by massing shields to intercept arrows. Persian infantry was lightly armored and had wicker shields that were worthless against the swords and long spears of the hoplites. See http://www.cais-soas.com/CAIS/History/hakhamaneshian/AchaemenidMilitaryEquip.htm. 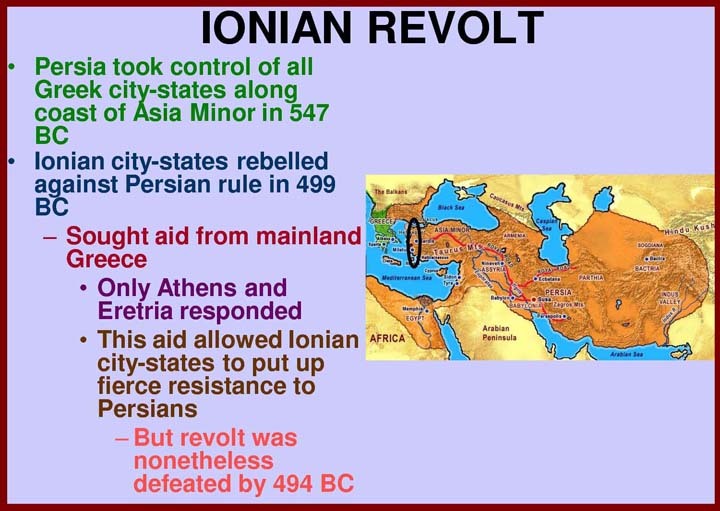 The Ionian revolt was really just a pinprick as far as the Persian Empire was concerned, something that could be and was easily put down by just shifting a few troops to the area. It started with a rivalry between two Milesian politicians and involved only the extreme western fringe of the empire. Its most important result was that it brought Athens to the attention of Darius. He called together troops from his satrapies and sent and expeditionary force to Greece. The plan was to island-hop across the Aegean and land at a beach called Marathon. started in 499 -- the Ionians who revolted against Persia just as Greek as the Athenians and Spartans, and they were from prosperous and important Greek cities. 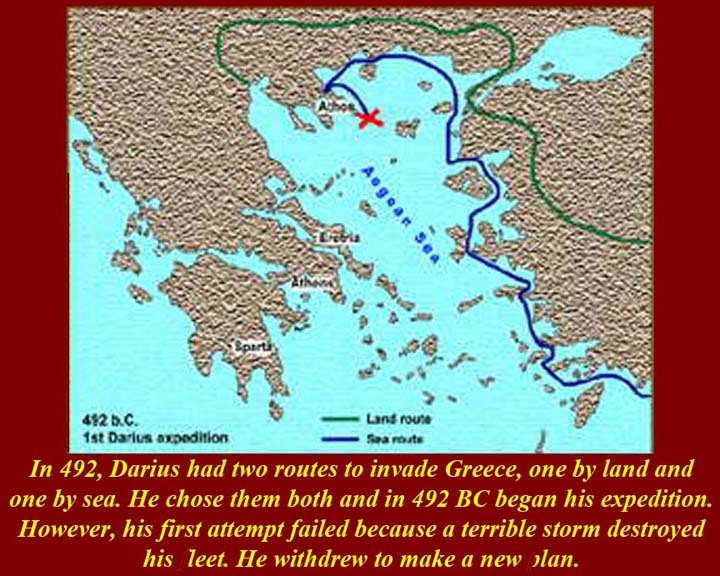 And the 490 BC expedition was not even the first attempt by Darius to invade Mainland Greece. 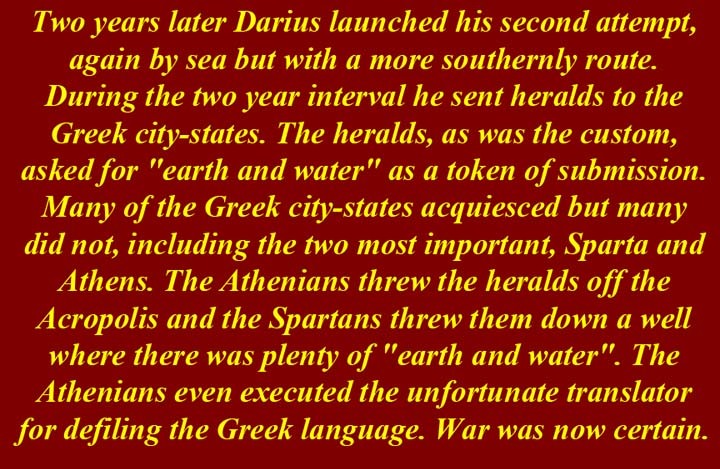 In 492 BC, just two year after finally squelching the Ionian Revolt, Darius had assembled an invasion force and started marching around the northern end of the Aegean Sea. For the invasion to be successful, logistics support had to be supplied by the accompanying Persian fleet. The 492 BC campaign, led by Mardonius, re-subjugated Thrace and forced Macedon to become a client kingdom of Persia, after being allied or a vassal to Persia as early as the late 6th century BC. However, further progress was prevented when Mardonius's fleet was wrecked in a storm off the coast of Mount Athos. The land army held its position but could not move south into the developed Greek homelands. To avoid the rough seas that had destroyed the 492 expedition, the 490 expedition island-hopped across the southern Aegean, taking Greek islands as they went. 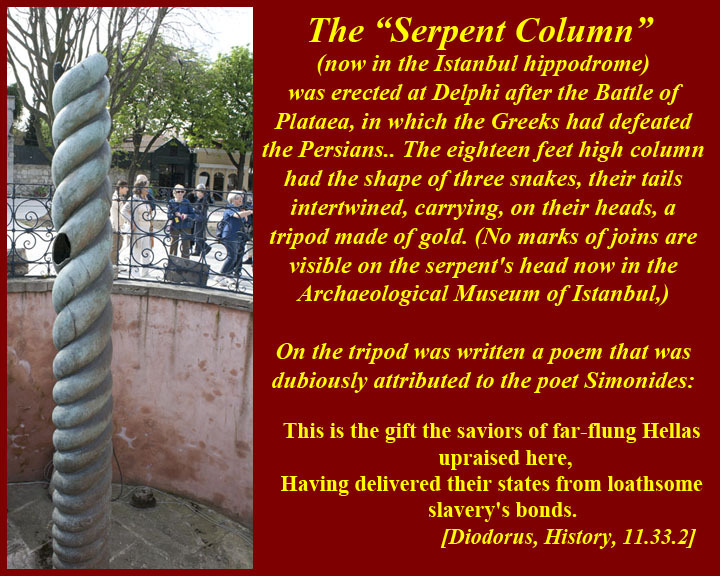 Almost all submitted without a fight until they got to Euboea where the Persians invested the island's mini-metropolis, the very Eritrea that, with Athens, had joined the Milesians in the sack of Sardis. Eretria was sacked after a six day siege, men killed, women and children enslaved. Clearly the Athenians had something to worry about. 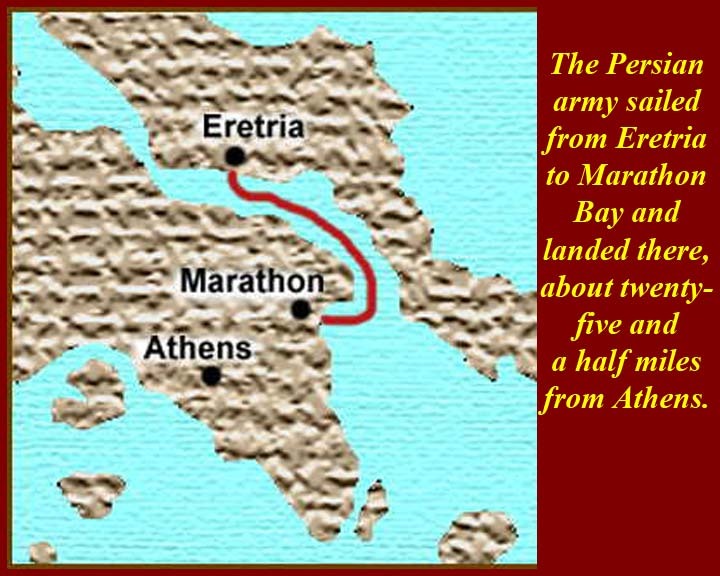 After taking Eretria, the Persian forces reembarked and sailed down and across the South Euboean Gulf to Marathon. There they were intercepted by an Athenian defensive force led by the ten stratagoi (annually elected Generals) of Athens for 490 BC, one of whom was Miltiades. Miltiades was not particularly popular at this point in Athens; he was a refugee former tyrant of the Thracian Cheronese, who with his family had fled to Athens after the collapse of the Ionian revolt. In 490, Athens was in one of its democratic phases having ousted its own Peisistratid tyrants, and Miltiades had been sent to Thrace by the Peisistratids. Nonetheless, Miltiades was elected as a strategos, because he had military experience; he had actually been an impressed General on the Persian side in the Persian incursion north of the Danube, and he later was a local leader in the suppressed Ionian revolt against the Persians. 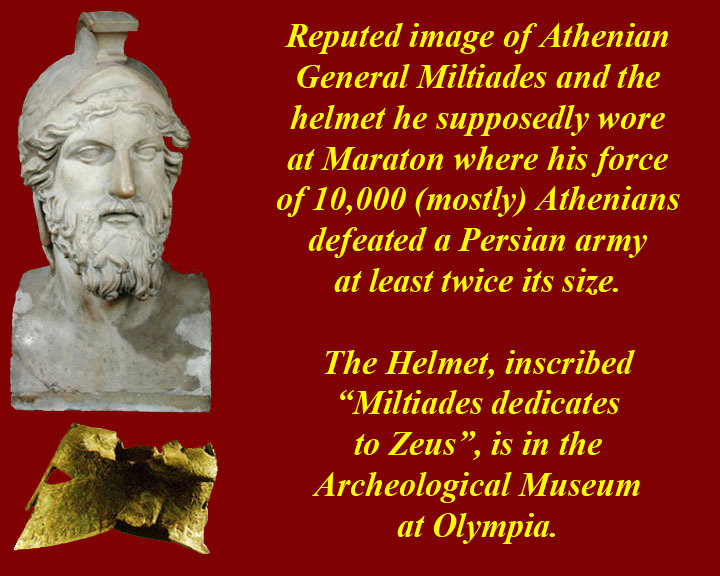 Miltiades' experience fighting for and then against the Persians gave him valuable insights about Persian military tactics, and it was his plan that was used in the Athenian victory over the Persians at Marathon. 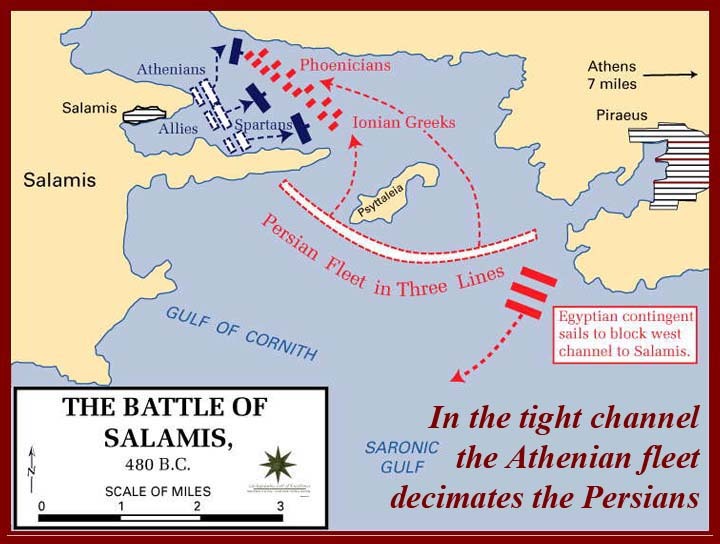 There was a five/six day face off, during which Miltiades convinced Calimachus (the Athenian polemarch = CIC) to attack and also during which he altered the battlefield by piling rubble and felled trees on its flanks making it difficult if not impossible for the Persians to use their cavalry. Then, on the day that it was Miltiades' turn to command the Athenian force, he spread thin his center and reinforced his flanks. The Greeks then charged forward and were met by a Persian counter-charge which pushed back (and may have penetrated) the Greek center. The Persians made the fatal mistake of pushing past the reinforced Athenian flanks, which swung in behind the Persians in a double envelopment. Some of the Persians managed to escape into the swamp at the northern end of Marathon Bay and scrambled back to the beached Persian troop ships. It was a total victory for the 10,000 mostly Athenian troops against a Persian force estimated by modern historians to have been about 25,000 Persians. The Spartans, who had delayed the departure of their reinforcements for a religious observance, finally arrived a few days after the battle and were given battlefield tours by remaining celebrating Athenians. But most of the Athenians had already marched away back toward Athens -- when they had left to fight the Persians at Marathon they had denuded the defenses if their metropolis. A runner had already alerted the city of the Athenian victory and of the withdrawal of the Persian fleet; a fleet that hoped to be able to attack an undefended Athens. 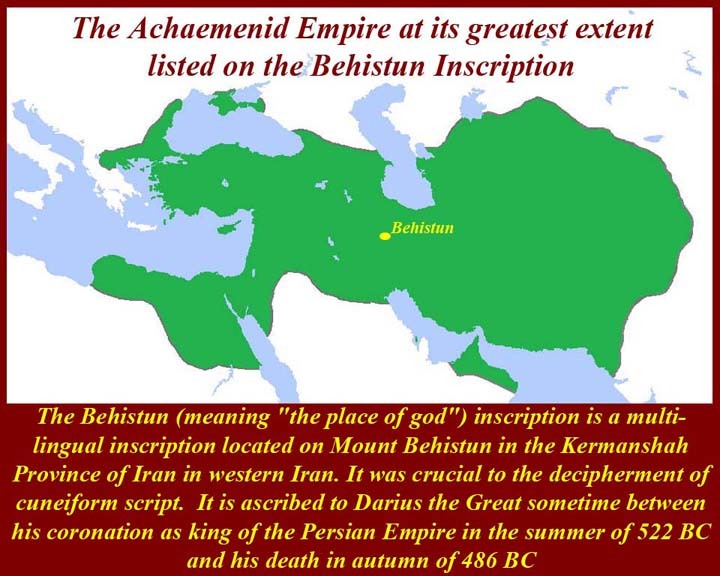 Only noncombatant Athenians were manning the walls when the Persian fleet, having rounded the southern end of Attica, hove to off Athens, but that was enough to cause the Persian commanders to hesitate. During their hesitation the victorious Athenian army arrived from Marathon, and the Persians realized they had lost their chance to take the city. The Persians sailed home without any prizes. Darius vowed to send another expeditionary force to take mainland Greece and especially Athens, but he died in battle putting down a revolt on his eastern border and was succeeded by Xerxes. 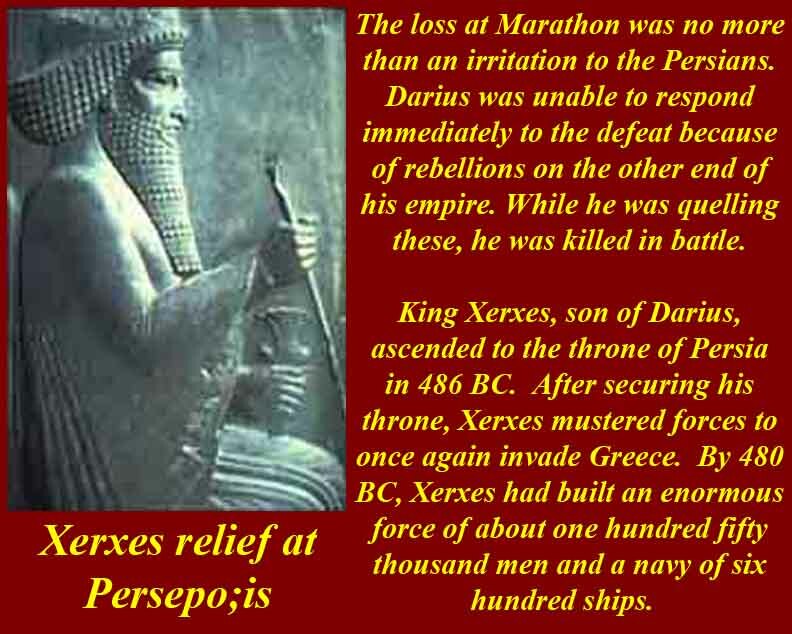 In 480 BC, Xerxes, after consolidating his power in the Persian Empire gathered and led a much bigger Persian force (hundreds of thousands) for a new expedition to mainland Greece. For information on Miltiades, see http://www.livius.org/articles/person/miltiades/. 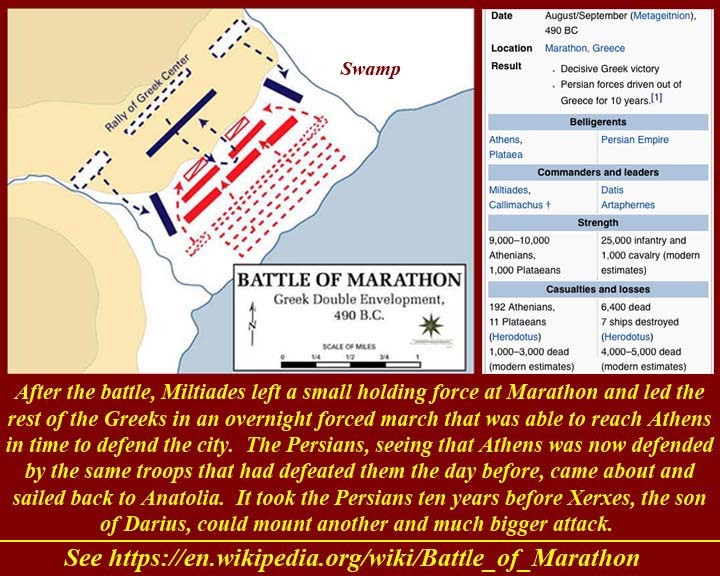 For information on the 490BC Persian invasion and the Marathon battle, see https://en.wikipedia.org/wiki/First_Persian_invasion_of_Greece and https://en.wikipedia.org/wiki/Battle_of_Marathon. The name of the athletic long-distance endurance race, the "marathon", comes from the legend of Pheidippides, a Greek soldier and runner who was sent from Marathon to Athens to announce that the Persians had been defeated in the Battle of Marathon. It's just a legend. 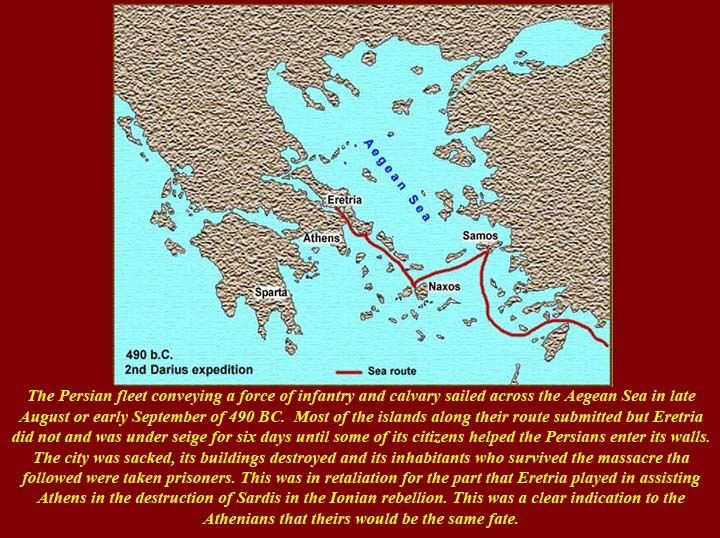 Xerxes marched his men around the north end of the Aegean. In 480 BC, his army was moving down the western side of mainland Greece . His fleet of some 600 fighting ships (and, inevitably, the many necessary supply ships) moved along offshore at accompanying speed. In the mid-480s BC the Athenians found a rich new vein of silver in Attica. 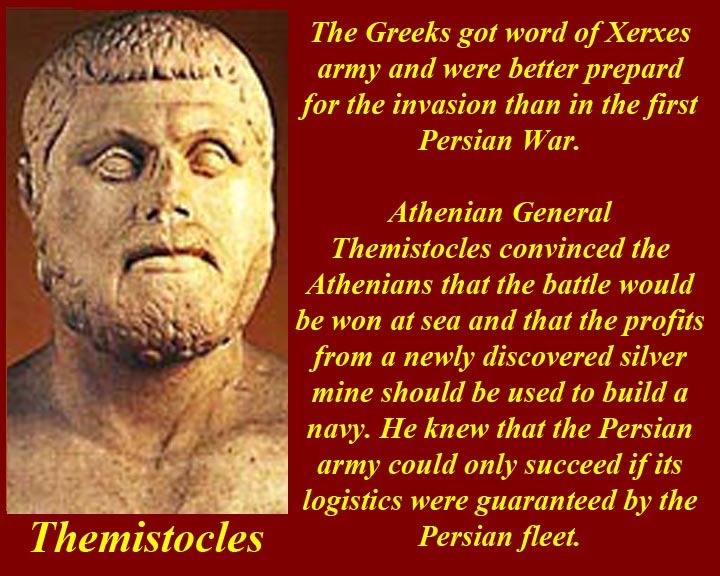 Themistocles, using a convenient Delphic oracle prophecy, argued successful for a "wooden wall" of ships to save Athens from the impending Persian invasion. Athens invested its newfound wealth to commission 200 triremes. 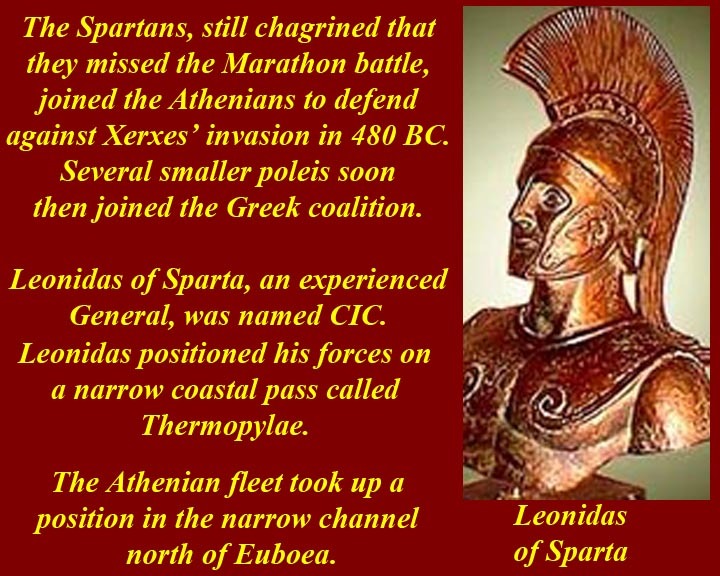 Then the Greeks, in a rare show of unity sent a coalition army under one of the Spartan Kings, Leonidas (who was in his 60's by 480) to hold the narrow coastal pass at Thermopylae (the name of which, because of hot springs, meant "Gateposts of Hell"). The Thermopylae Pass, now much wider due to sedimentation, facing westward from the low Phocian Wall, which was the Greek defensive position. Leonidas had perhaps 10,000 Greek hoplites against Xerxes 150,000 plus troops, but because of the narrowness of the coastal plain, the Persians were never able to bring their massive numerical advantage to forward edge of the battle area (FEBA). And at the FEBA the Persian light infantry was no match for aligned Greek hoplites. 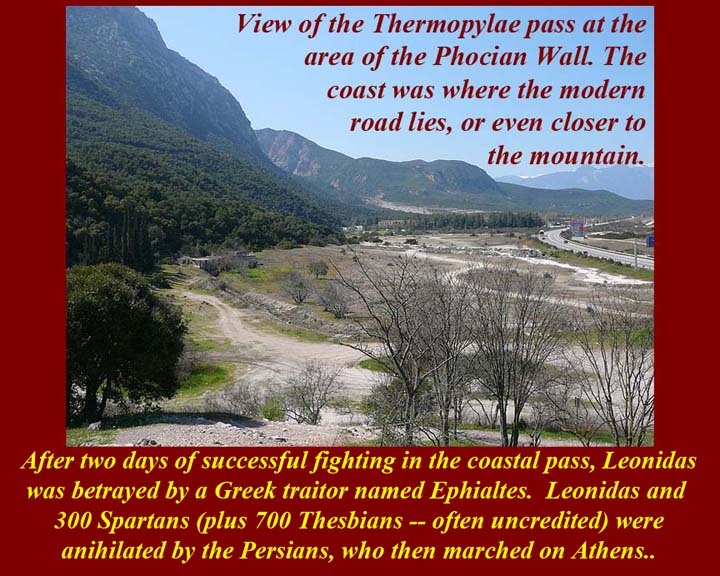 The Persians were stymied until near the end of the second day of fruitless attacks on the Greek line, a Trachinian (i.e., a Greek from the nearby town of Trachis) named Ephialtes informed Xerxes of the mountain path around Thermopylae and offered to guide the Persian army. Ephialtes apparently hoped for later rewards. For this act, the name of Ephialtes was permanently stigmatized; the name came to mean "nightmare" in Greek and become the archetypal traitor in Greek culture. Overnight, a Persian force used the Ephialtes' path to get behind the Greeks. Leonidas knew what was coming, so he dismissed all of the Greek troops except his own contingent of 300 Spartans. But 700 Thesbians refused to leave as did a few hundred Thebans. By all accounts, the Thebans quickly defected to the Persian side and the 300 Spartans and 700 Thesbians fought until the last man fell. Later Spartan propaganda suppressed the Thesbian role at Thermopylae; the Thesbians were not, in fact, memorialized at the Thermopylae battlefield until 1997 AD. Overall, the Greek forces at Thermopylae delayed the Persians for a week, including the four and one half days before the Persians actually attacked the hoplite line. 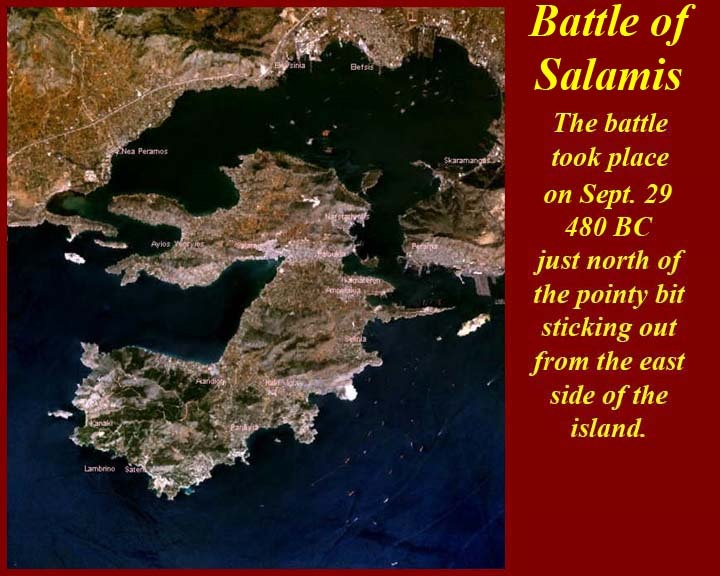 Athens used that week to evacuate to Salamis Island. Themistocles' Athenian fleet, which had blocked the Persian fleet north of Euboea redeployed in the narrow channel between the Attic coast and Salamis. 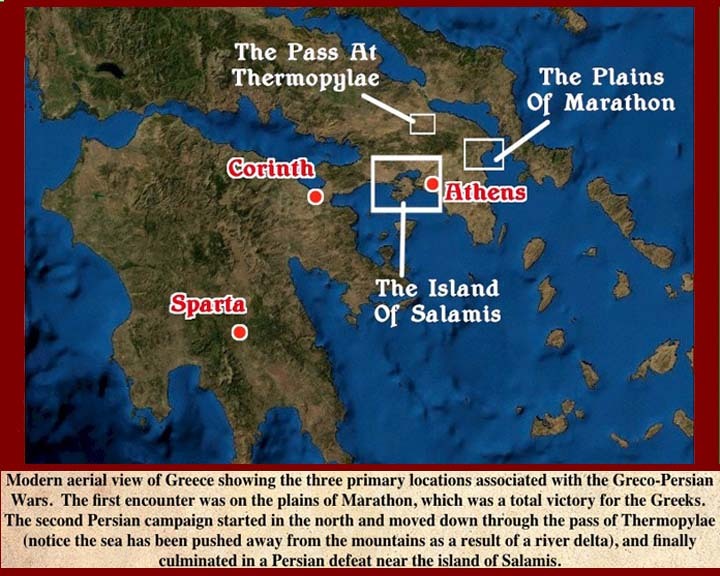 The Persians sacked and burned the virtually empty Athens urban center, but that did not destroy the Athenian polis -- the people of Athens -- which had decamped to Salamis behind the wooden walls of Themistocles' fleet. 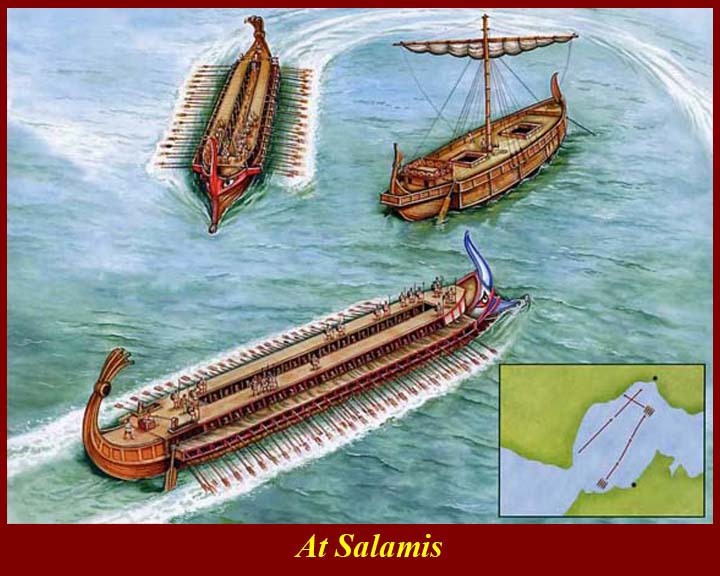 The Salamis sea battle was a replay of the Marathon battle on land. The Athenian fleet withdrew, only to turn and attack while more Athenian ships closed in from the flanks. 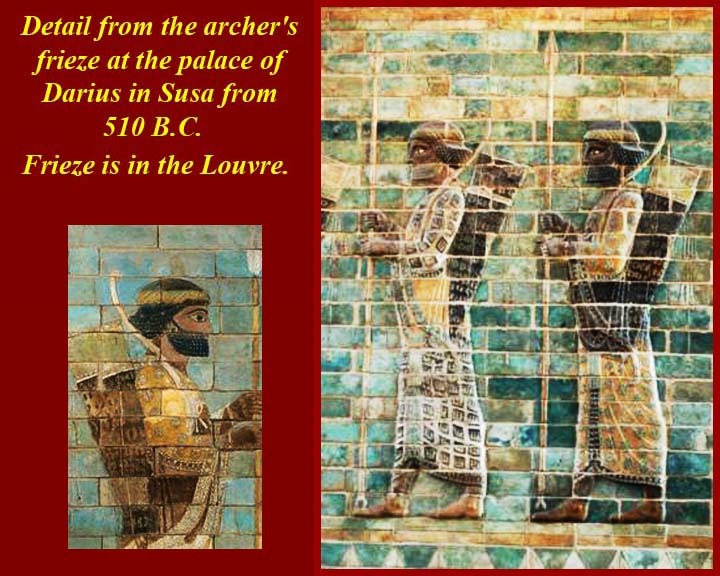 The narrow confines again prevented the Persians from bringing their superior numbers to bear. In various War College classes around the world, much has been made of the superior psychology of the Athenians who were fighting for the safety of their families and for their own lives as opposed to the Persian fleet sailors who were of mixed ethnicity and were fighting for no perceived benefit to themselves. The Persian fleet commanders were, of course, also well aware that the best of their navy had already been destroyed by a storm east of Euboea Island. 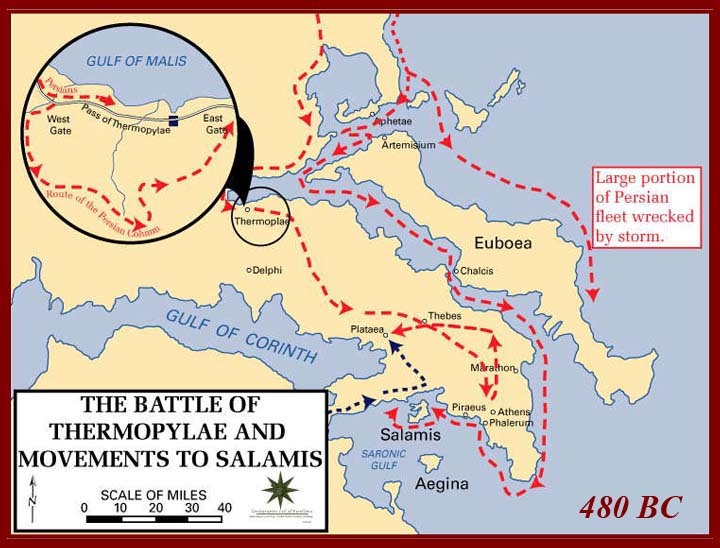 As a result of subterfuge on the part of Themistocles, the Persian navy sailed into the Straits of Salamis and tried to block both entrances. In the cramped conditions of the Straits the great Persian numbers were an active hindrance, as ships struggled to maneuver and became disorganized. Seizing the opportunity, the Greek fleet formed in line and scored a decisive victory. 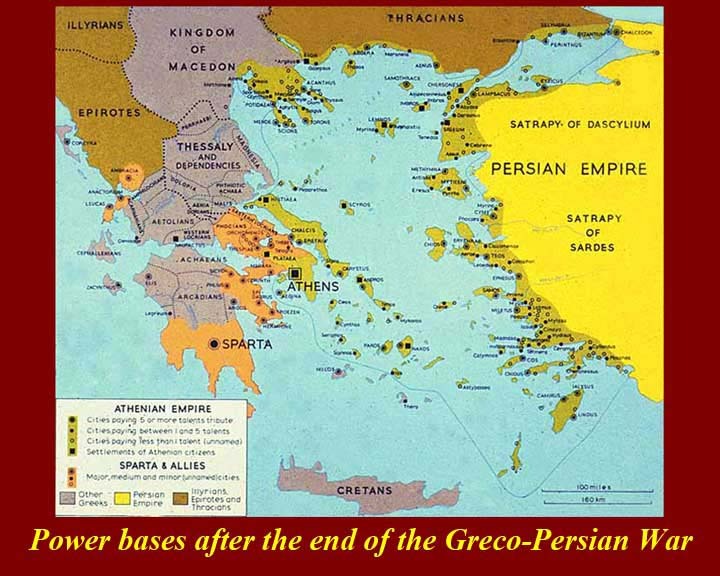 Xerxes then retreated to Asia with much of his army, leaving Mardonius to complete the conquest of Greece. 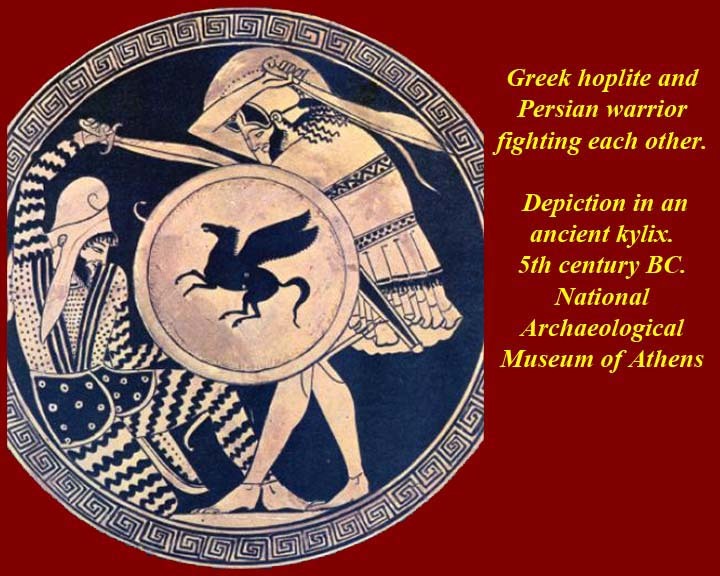 However, the following year, the remainder of the Persian army was decisively beaten at the Battle of Plataea and the Persian navy at the Battle of Mykalel. Afterwards the Persians made no more attempts to conquer the Greek mainland. 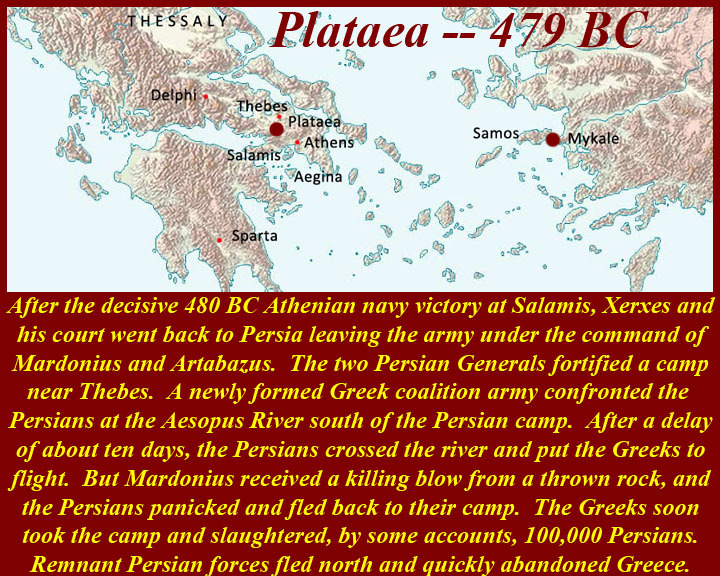 At Plataea (479 BC), the Persians had the advantage of numbers and were winning on a confused battlefield until according to the only account available (Herodotus) until the Persian commander was killed by a lucky thrown stone. From then on it was a rout of the Persians. See http://www.livius.org/he-hg/herodotus/logos9_26.html and https://en.wikipedia.org/wiki/Battle_of_Plataea. Plataea was the last battle on the Greek mainland, but the Greek war with the Persians continued oversees for another thirty years. 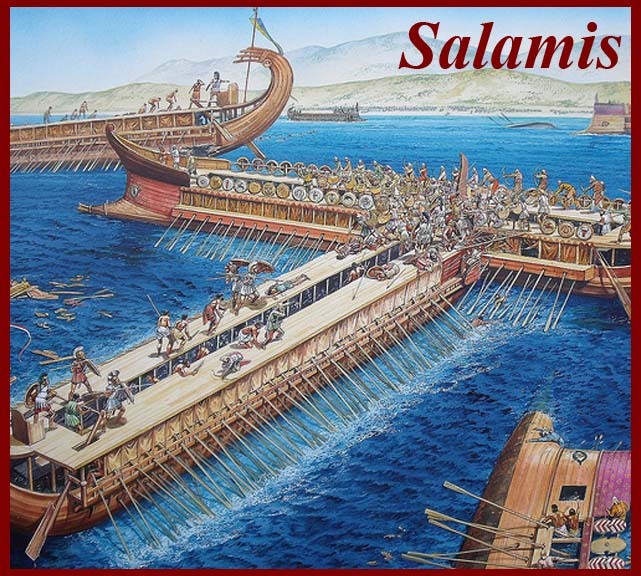 What was left of the Persian fleet after the Salamis battle retreated across the Aegean Sea to the channel between Samos Island and the point on which stood the Ionian town of Mykale, and it was there that the Athenian fleet found it. 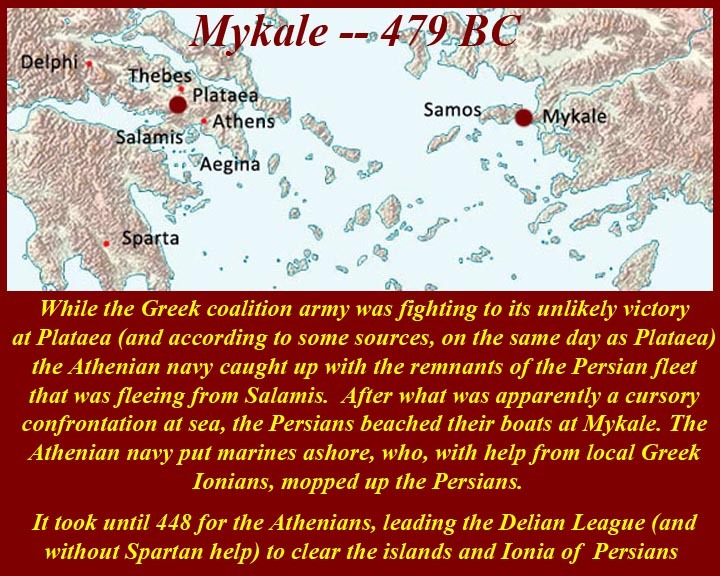 In 479 BC, Mykale was the site of one of the two major battles that ended the Persian invasion of Greece, during the Greco-Persian Wars. Under the leadership of the Spartan Leotychides, the Greek fleet defeated the Persian fleet which ran their boats aground and sought protection of a large Persian garrison. The Greeks burned the Persian fleet on shore and roundly defeated the Persian land army. "Now on the same day on which the defeat took place at Plataea, another took place also, as fortune would have it, at Mykale in Ionia. ..."
Start of Book 9, Chapter 90 of the Histories of Herodotus, the 90s and 100s chapters continue with the battle details. There is no way to verify the claim of Herodotus that Plataea and Mykale occurred on the same day. It does make a good story. The Spartans were not particularly interested in overseas expeditions or naval development, so they let the Athenians have that field of endeavor. And the Athenians did well, eventually taking back from the Persians the Ionian coastline (western coast of modern Turkey) as well as Cyprus, Thracian coastal areas, Byzantium the Hellespont and Sea of Marmara, the Nile Delta as far south as Memphis and by extension of the last, Cyrene. 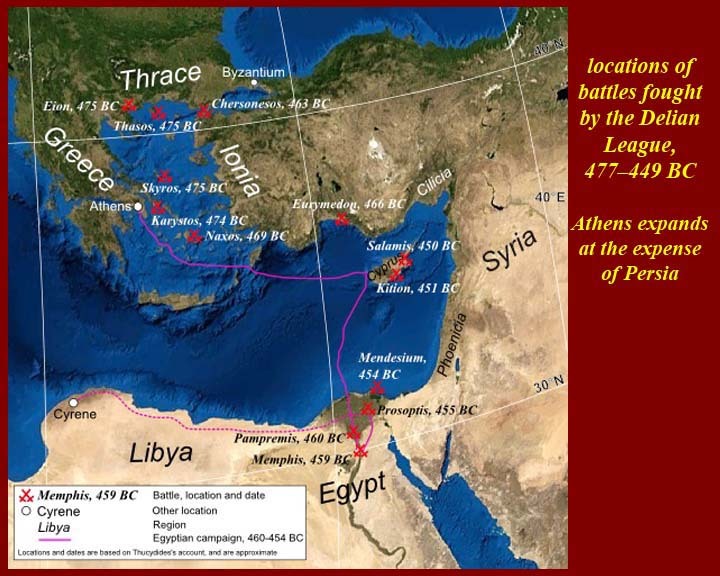 From 477 BC, these conquests had been accomplished by the Athenian dominated Delian League", which by 431 BC had clearly morphed into an "Athenian Empire" in the Eastern Mediterranean. It was the Empire that worried the Spartans and their Peloponnesian League enough that they started the Peloponnesian War (431-4-4 BC).